Not much of White Christmas has a point beyond presenting the work of Irving Berlin yet again to maximize the appeal of the title song. That leaves the film with a threadbare plot, two single performers banding together with two attractive female performers to help an old army General breathe some life into a failing business. In-between it all are songs, and dancing, and songs, and dancing… the cycle is endless for these musical numbers, regardless of whether or not they advance any narrative. The movie focuses more on the rehearsals than the final act itself purely to light up the screen with the non-stop high energy of Danny Kaye and Bing Crosby. It’s there to keep the energy flowing with classical Hollywood romance as Vera-Ellen and Rosemary Clooney vie for the affections of the male leads… or the other way around. It’s also there to generate those positive, warm feelings with no animosity or sorrow. Whether they all serve a purpose or not, the dance routines are nothing short of stunning, a number between Danny Kaye and Vera-Ellen done in a single take. It’s a grand studio set on a pier, the choreographed piece ending up on a roof, stairs, and down the pier on a conveniently placed pulley. There’s not an edit to be found or a mistake, an incredible bit of dedication to pull that off and it’s hardly a simple number. Everything about the film is lavish, classical studio style in all regards. The costumes are overloaded with intricate work, the exterior of the inn an expansive bit of interior set design, and even the opening moments in a destroyed city during the war given depth thanks to the detail. Colors are carefully chosen to coordinate between everybody without clashing, all to extract the most from Technicolor. White Christmas does almost everything right and it’s hard film to hate, even if it is a rather shameless attempt at milking a familiar theme. It hangs on the back of the past success of Holiday Inn for all its worth (the inn set here is the same only remodeled), the script more a backdrop piece designed to build up to that moment when the doors swing open, lovers reunite, and the snow finally falls. So be it. It’s a crying shame Paramount releases so few classics on Blu-ray, because almost everything they touch from these pre-1960 efforts are gold. African Queen was a beauty, and White Christmas is practically its equal. As the first film to utilize Vistavision, a fine-grained flat widescreen format, the results in HD are marvelous. No doubt it’s the sharpness of it all that is the initial stunner, the opening war sequences so crisp, so clear, and so modern it’s startling. From the stray debris lining the streets to the intricate detailings of the uniforms, every bit of the frame is alive with perfection. Minor dips, including the inevitable technological faults due to some of the early fades, are so brief they hardly matter. All of the craftsmanship is now easily appreciated on these costumes too, the vivid blue dresses worn by Vera-Ellen and Clooney during their “Sisters” number staggering in their definition. The color comes next, the striking hues and dazzling shades so refined as to be nothing short of brilliant. It helps to skip to the end where everyone dons that Santa red, so vibrant that is leaps off the screen and takes on a life of its own without bleeding. Bright yellows worn by Vera-Ellen at times are equally as intense. Crosby’s blue eyes are remarkable, and the greens of the plants around the inn grounds are on par with everything else. Technicolor also provided flesh tones with an added layer of warmth, not enough to appear out of place, but enough to make them stand out. Black levels are outstanding, the dark dress worn by Clooney during a late number remarkable. There are no signs of crush or loss of detail. The minimal grain structure is easily resolved by this more than adequate AVC encode, never falling victim to compression. If there’s anything here to take note of it’s the rather distracting level of damage, minor compared to most to be sure, but the rather consistent level of specks dotted around the print make it look like it’s snowing sporadically long before it should. Another damage pass certainly wouldn’t have hurt, although there are no other technical faults in terms of the source. The print is stable, flicker is non-existent, and scratches (if any) have been carefully eliminated. The DTS-HD 5.1 mix seem like a bit of a waste as the restored mono sits with a paltry compressed Dolby Digital affair. That said, there’s nothing wrong with the enhanced audio. Almost everything sits in the center anyway, the songs breathing slightly into the stereo channels at their peak. Undoubtedly it’s the music that impresses the most, especially since there’s not much else going on in the first place. The audio carries a comforting warmth much like the movie, lyrics and orchestrated backdrops separated from each other to ensure nothing is lost. There’s very little distortion or distracting drops in fidelity. In fact, the audio might even be in better shape than the video. Any hiss has been eliminated, leaving the clean dialogue to function on its own. The rare line or two may come through slightly muffled (Kaye and Vera-Ellen discussing the engagement has a notable one), but it generally remains firm. Oddly, the whole thing is mixed staggeringly low, requiring a significant volume boost to get the wanted results. A commentary from Rosemary Clooney was recorded not long before her death in 2002, and she’s enthusiastic about the project. Backstage Stories gathers historians and writers to discuss the general making-of material, followed by a tour of Clooney’s Kentucky home. Together, those run about 25-minutes. Bing Crosby’s Christmas Crooner looks at his influence up to the modern artists of the day. 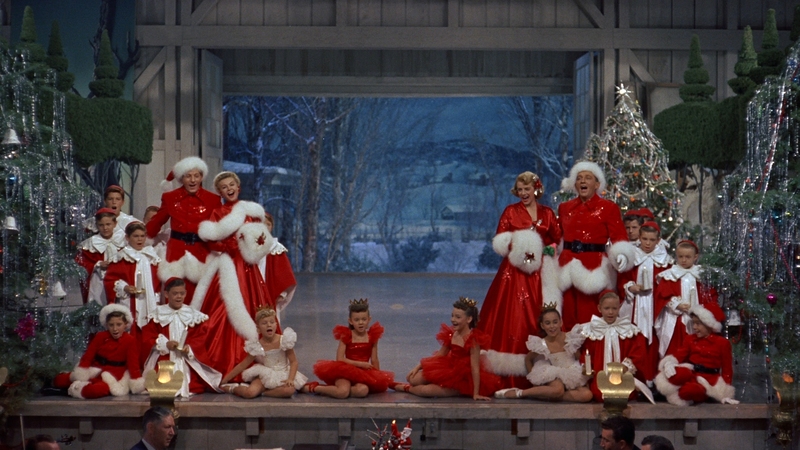 Danny Kaye: Joy to the World is a brief bio, followed by what amounts to a promo for the stage version of the film. A Look Back with Rosemary Clooney is an older piece detailing additional making-of material. Two trailers are left.